I have enjoyed the water filters I added to my mobile homes and manufactured homes. I've got a whole house water filter and attached it to the incoming mobile home plumbing supply line from my water meter. My previous mobile home was on a well and the filter did a great job of keeping sand out of the faucet aerators, washing machine screen filters in the supply hoses and toilet fill valves. I selected a convenient spot under the house since you will have to access it occasionally to replace the filter. You can select different types of whole house water filters for your particular use. 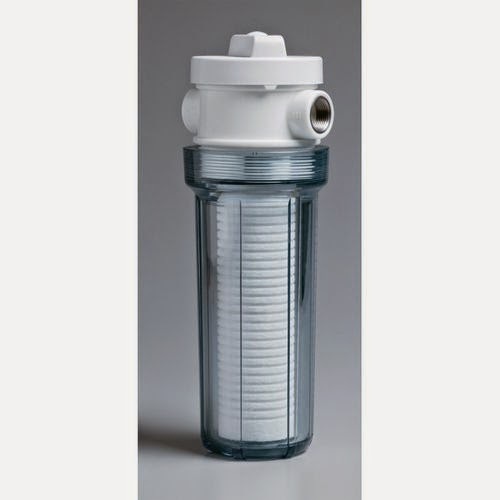 The filtration capabilities of sediments and contaminants for filters are measured in microns. The less the micron size the smaller the particles that it will filter. You can also get odor reducing, iron removing and etc. Be sure to get the plumbing couplings, male and female adapters and other hardware to complete the plumbing job. Whole house filters are inexpensive water filtration systems that are easy to install and can save you plumbing problems. Here is a picture of a typical whole house filter.